The Eurekan is a three day physical challenge. Day one is a sprint-distance triathlon. Day two is a road bike tour and Day three is a bike and running race. Finish with the best at the Eurekan Finish Line in the heart of Eureka Springs in front of the historic Courthouse downtown. 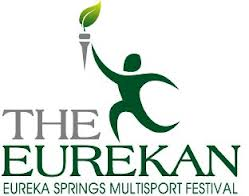 Follow The Eureka Springs Multisport Festival on Facebook & Twitter for the lastest or register on the eurekasportsfestival website. See more great events on the Official Eureka Springs Calendar of Events! This entry was posted on July 30, 2013 by estcblog in Festivals, Fun Downtown, The Great Outdoors, Things to Do and tagged adventure, Arkansas, downtown, Eureka Springs Arkansas, historic downtown, Outdoor.